The Producer Suite empowers you to collect, process, analyze and understand raw geospatial data, and ultimately deliver usable information. This includes Hexagon Geospatial’s desktop-based GIS, remote sensing and photogrammetry offerings. ERDAS IMAGINE®, the world’s leading geospatial data authoring system, incorporates geospatial image processing and analysis, remote sensing, and GIS capabilities into a single powerful, convenient package. ERDAS IMAGINE enables users to easily create value-added products such as 2D and 3D images, 3D flythrough movies, and cartographic-quality map compositions from geospatial data. ERDAS IMAGINE is available in three product tiers to scale with your geospatial data production needs. IMAGINE EssentialsThe entry-level tier of ERDAS IMAGINE, offers the basic tools for geospatial mapping, visualization, enhancement, and geocorrection, including enterprise-enabled access to OGC® web services and relational databases such as ArcSDE and Oracle Spatial. IMAGINE AdvantageThe mid-level tier of ERDAS IMAGINE, builds upon the geospatial capabilities of IMAGINE Essentials to offer more advanced and precise mapping, point cloud, and image processing capabilities. IMAGINE Advantage gives GIS professionals, image analysts, and photogrammetrists more analysis capabilities to make better, more informed decisions. IMAGINE Advantage can provide strategic value to a variety of industries, including data providers, agriculture, forestry, natural resource management, telecommunications, environmental engineering, and the extractive industries. IMAGINE ProfessionalThis is a comprehensive geographic imaging package for advanced image processing, remote sensing and GIS professionals. IMAGINE Professional includes all the capabilities of IMAGINE Essentials and IMAGINE Advantage and advanced features such as graphical data modeling, advanced image classification, point cloud classification and extended hyperspectral tools. In addition, IMAGE Professional customers also receive ERDAS ER Mapper. Hexagon Geospatial also offers an expansion pack to expand the core functionality of ERDAS IMAGINE. 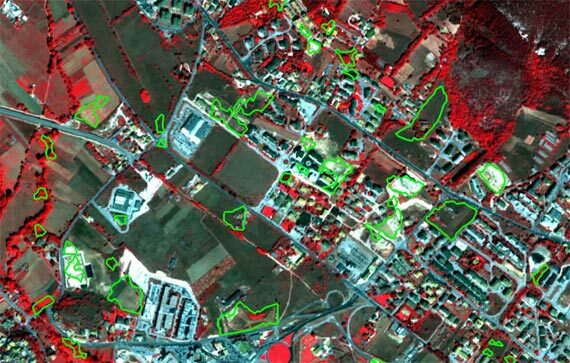 ERDAS ER Mapper is a powerful, yet simple to use geospatial imagery processing application. This solution enhances your geographic data to make it more meaningful and allow you to extract quantitative information and solve problems. It is ideal for GIS users and other geospatial professionals for preparing, manipulating and compressing huge quantities of imagery data. Includes mosaic, colour balancing, compression, geocoding and other image preparation wizards to simplify your workflow. Dynamic, on the fly processing. ECW and JPEG2000 compression. Shared licensing has been implemented between ERDAS IMAGINE Professional and ER Mapper. This means that with an IMAGINE Professional license you can also install and run ER Mapper adding a full set of functionality for you at no additional cost. 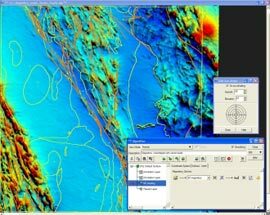 A Geographic Information System (GIS) allows the user to graphically display data that can be analysed, queried, interpreted to reveal trends and events. GeoMedia is offered within the PRODUCER SUITE of the Hexagon Geospatial’s Power Portfolio.The Producer Suite empowers you to collect, process, analyze andunderstand raw geospatial data, and ultimately deliver usable information.This includes Hexagon Geospatial’s desktop-based GiS, remote sensing,and photogrammetry offerings. GeoMedia® is a powerful, flexible GIS management platform that lets you aggregate data from a variety of sources and analyze them in unison to extract clear, actionable information. It provides simultaneous access to geospatial data in almost any form, uniting them in a single map view for eficient processing, analysis, presentation, and sharing. In addition, GeoMedia has specialized functionality that makes it ideal for extracting information from an array of ever-changing data and supporting smarter decisions. Links to Enterprise Database Management Systems – The links between our remote sensing and GIS products enable GIS updates from your raster imagery, improving the accuracy and relevance of your data resources. 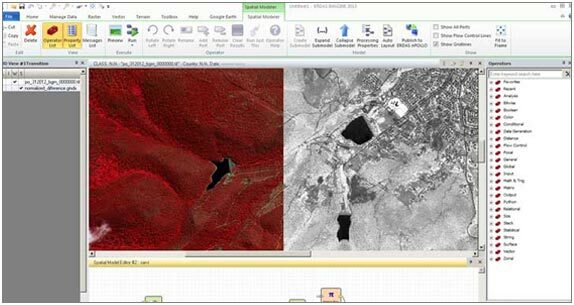 Capitalize on the coordination between GeoMedia and ERDAS IMAGINE, the world’s leading geospatial data authoring system, to create vector layers based on accurately processed raster imagery. Both GeoMedia Objects and GeoMedia Viewer remain desktop core products. A development toolkit consisting of embeddable mapping and GIS components, allows you to create custom GIS solutions based upon Intergraph GeoMedia 2015 objects. This is a freely distributable mechanism for map display, simple analysis and output of GeoMedia GeoWorkspace data. IMAGINE Photogrammetry (formerly LPS) is a separate bundle which contains a complete suite of photogrammetric production tools for triangulation, generating terrain models, producing orthomosaics, and extracting 3D features. It supports panchromatic, color, and multispectral imagery with up to 16 bits per band. Projects can be completed in hundreds of different coordinate systems and map projections. IMAGINE Photogrammetry maximizes productivity with automated algorithms, fast processing, and a tight focus on workflow. IMAGINE Photogrammetry increases accuracy through state-of-the-art photogrammetric and image processing algorithms for automatic point measurement, triangulation, automatic terrain extraction, and subpixel point positioning. Accuracy reports, built-in data quality checks, and editing tools help users achieve the high standard of quality they demand. The power and precision of IMAGINE Photogrammetry stems from Hexagon Geospatial’s extensive experience developing the world’s leading photogrammetric, remote sensing, and geospatial imaging software. With each IMAGINE Photogrammetry license we supply, you will get an ERDAS IMAGINE Advantage Level License (included in the price). IMAGINE Photogrammetry is a complete suite of photogrammetric production tools for triangulation, generating terrain models, producing orthomosaics and extracting 3D features. Automating precision measurement, maintaining accuracy, and including flexible operations such as terrain editing and feature extraction, IMAGINE Photogrammetry increases productivity while ensuring high accuracy. Offering a variety of functional add-on modules, IMAGINE Photogrammetry adapts to your specific business needs, enabling a seamless, process-driven workflow. IMAGINE Photogrammetry maximizes efficiency without compromising quality and accuracy. Designed specifically for ease of use, it frees users from the steep learning curve often associated with photogrammetric software. The clean, intuitive interface makes it easy to learn and easy to use. The workflow-driven toolbar guides the process, giving you everything you need to execute a photogrammetric project from beginning to end. Data interoperability is never an issue with the extensive variety of input and output formats that are dynamically supported, including data from other leading photogrammetric software. Superior technology does not have to come with a higher price tag. As a pure photogrammetry solution, IMAGINE Photogrammetry is already affordable. But we also include IMAGINE Advantage in the package, providing the largest array of functionality for the price in the industry. Integrating IMAGINE Photogrammetry with the capabilities of ERDAS IMAGINE enables multiple workflows. IMAGINE Photogrammetry uses state-of-the-art photogrammertric and image processing technology to fine-tune your data and report results. IMAGINE Photogrammetry includes the ability to edit terrain and collect points in stereo, which saves time and increases accuracy. With the ability to have multiple stereo views open in a variety of viewing options—Stereo, Split Panel, Mono, and Tri-View—and the ability to operate in either fixed cursor or fixed image mode, IMAGINE Photogrammetry is flexible enough to let you be your most productive. IMAGINE Photogrammetry supports a wide array of workflows, processing imagery from a variety of sensors. With highly flexible, yet easy-to-use tools, IMAGINE Photogrammetry supports the creation of photogrammetric data products for an assortment of purposes ranging from GIS to precision engineering applications. Intergraph offers an array of add-ons that expand the core functionality of IMAGINE Photogrammetry, making your photogrammetry investment more versatile and productive. Stereo Analyst for ArcGIS: Create and maintain comprehensive databases of feature data using stereo visualization, which lets you distinguish the features in your imagery faster and more easily, and increases the accuracy of the features that you collect. ERDAS Terrain Editor for ArcGIS: Update Geodatabase Terrain datasets. FeatureAssist for ArcGIS: Collect roof structures in the ESRI Multipatch format. Use ArcGIS for Server to deliver enhanced compression wavelet (ECW) data to clients via OGC-compliant Web Coverage Services (WCS) and Web Map Services (WMS). With simple drag-and-drop file selection, you can quickly and easily create realistic 3D environments. Go far beyond simple 3D renderings and basic fly-throughs by draping maps, aerial photography, satellite imagery, or analytical results onto an elevation layer. The ability to quickly and precisely register two images is critical in any pan-sharpening or change detection workflow. Using project-based workflows, users can do the necessary pre-processing, change detection, change filtering and interpretation. Flexible and interactive tools enable the user to target specific kinds of changes that are of interest to them while ignoring seasonal differences,shadows, and even slight misalignment. 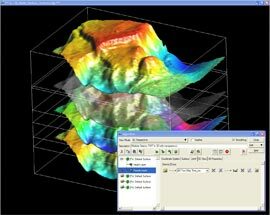 IMAGINE Radar Mapping Suite – Process radar data within ERDAS IMAGINE. IMAGINE Radar Mapping Suite provides tools to geocode, orthorectify, despeckle, and calibrate radar images. The IMAGINE SAR Interferometry module automates coherent change detection, DEM extraction, and subsidence mapping to centimeter-level accuracy. IMAGINE Feature Interoperability – Use additional vector formats, including DGN v7 and v8 from MicroStation. IMAGINE MrSID Encoders – Compress more than 150 different image formats into the MrSID wavelet-based image compression format. IMAGINE NITF 2.1 – Import and export NITF 2.0 and 2.1 files, a standard imagery file format used by the US intelligence community, International Standards Organization (ISO), American National Standards Institute (ANSI), and the North Atlantic Treaty Organization (NATO). Map2PDF for IMAGINE – Create geospatially enabled GeoPDF maps that you can access in Adobe Reader. IMAGINE Enterprise Loader – Upload data to an Oracle Spatial database. IMAGINE Easytrace – Semi-automated feature extraction. Collect features by simply placing a few vertices along the line or polygon. IMAGINE Easytrace automatically places the other points to precisely define the feature. IMAGINE Objective – Automatically find and collect features in imagery so you can create and update your vector feature layers. 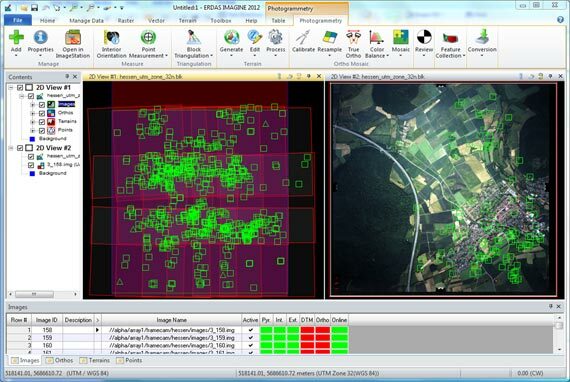 Stereo Analyst for ERDAS IMAGINE – Use stereo pairs to collect 3D vector features from imagery. 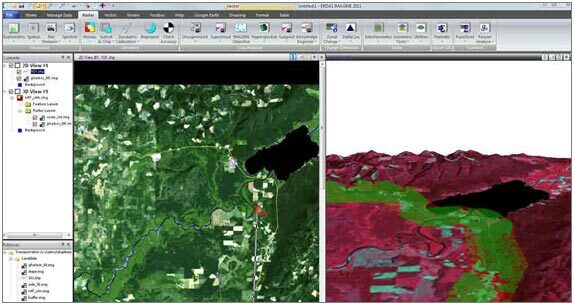 IMAGINE Vector – Convert raster to vector (and vice versa) and from one vector format to another, change projections, recalculate elevation values, and digitize and edit vector feature layers using raster imagery. ATCOR – Remove or reduce the effects of atmospheric distortion, haze, and shadowing in your imagery. ERDAS Engine – Distribute demanding, resource-intensive processes among different workstations or multiple cores on a single workstation so many processes can run simultaneously. Helps transportation professionals efficiently analyze and maintain your linear features and infrastructure. This add-on requires GeoMedia Professional. Provides enhanced cartographic capabilities and high levels of automation for production of their map series products and ad hoc hard copy maps. This add-on requires GeoMedia Professional. As a Hexagon Geospatial Platinum Partner, our knowledgeable and experienced team is proud to offer the full range of Hexagon Geospatial Software and Server solutions.